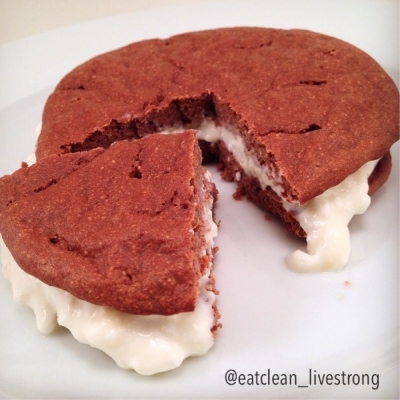 Guilt Free GIANTTTT whoopie pies made with @gbutter ! Combine all Whoopie Pie ingredients in a small food proccesor. Drop battter into 4 equally sized disks on a parchment paper lined baking sheet (for easy removal). You can spread your batter out if you desire. Bake for 18-20 minutes, or until center of cake pieces are baked through. Place in fridge to cool for a few minutes. Meanwhile, combine Cream Filling ingredients. Sandwich Cream Filling between two of your chocolate cake pieces and enjoy!